Regular readers of The Candy Perfume Boy will know that I am a fully-fledged, card-holding member of the Muglerati. Seriously, I’m a total Mugler fan boy and pretty much adore every fragrance the brand has ever done. Why do I love them so? Well it’s simple really, they are the most daring, fabulous and ‘high-fashion’ of perfume houses and they constantly push the envelope with their olfactory output, creating couture scents that are as unique as they are beautiful. It’s difficult for me to pick my favourite Mugler perfume as my tastes switch between all of them on a regular basis, but the one I have the most affection for is Alien. This intergalactic jasmine is the fragrance I wore when I first met my soon-to-be husband (I love saying that – 75 days people!) and it is ingrained within my memory as an important perfume both sentimentally and artistically. This year Thierry Mugler will be launching a new version of this terrestrial perfume – Alien Eau Extraordinaire (review to come soon) – and to coincide with this launch the brand has revitalised their advertising campaign with a new image and TV spot (directed by Floria Sigismondi). 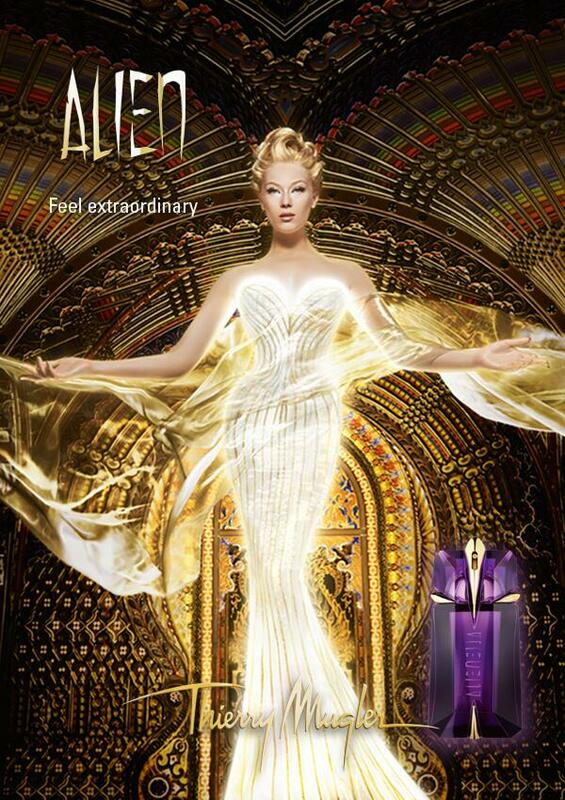 The new image can be seen above and displays Alien’s solar goddess bathed in a celestial glow and standing in a great hall like a statuesque monument to the sun.